Table Mountain is probably the biggest tourist attraction in the Western Cape Province. Whenever anyone lands, the first port of call is most definitely this magnificent mountain with its “table top”. The base of Table Mountain consists out of granite while most of the mountain is sculpted from sandstone and rises about 1 086 m above the bay. Its flat summit measures around 3 km from one end to the other. Table Mountain has been declared a national monument and is home to more than 1 470 species of plants. This is more than all the plant species put together in the whole of the British Isle! Many of these plants appear nowhere else on earth including the rare Silver Tree. On a clear day, the mountain is visible from over 200 km on the open sea. Most definitely a sight worth seeing. Take a boat out on the open sea and experience this breathtaking sight. It is unbelievable to think that people say Table Mountain was formed under the see, and because of erosion over millions of years (and many other reasons), it takes on the shape it has today. Devil’s Peak and Lion’s Head appear on the eastern and western side of the “table”. Table Mountain is as well known for its “tablecloth” as it is for the flat top shape of a table. You might ask what this tablecloth is, so let met quickly explain. During the summer months (December – February, but sometimes longer), a great amount of cloud cover appears over the top of the mountain when the southeaster blows. This causes a white cover that looks exactly like a tablecloth, used in the kitchen or anywhere else. Safe access to the summit of Table Mountain can be obtained by the cable car that was opened in 1929. This cable car has expanded and changed so much that the newest car is even rotating! You can see a 360°C view without having to move, or push other people around you. More than 600 000 people are conveyed to the top of the mountain every year and the total time it takes to reach the summit, is an unbelievable 6 minutes! On the summit is a restaurant and souvenir shop from which letters can be sent, bearing the Table Mountain postmark. If you prefer walking and enjoying nature, you can opt to climb the mountain. There are more than 350 recognised paths to the summit you can choose from, ranging from easy and comfortable to extremely difficult. When you choose one of these paths, please do make sure you are accompanied by someone experienced who knows the route very well. It is very easy to loose your way if you don’t know the area. In the past, lions, leopards and buffalo used to live in these mountains. Over the years they died out and were killed as the Cape became a city, inhabited by many people. Only baboons, small dear and rabbits remain. Going to see Table Mountain is a great experience, relaxing for the soul and giving you the chance to live and breath the magnificent views once you reach the summit. The tremendous beauty can not be described in words, so please make sure you visit this great “flat top” Table Mountain. Try to visit when the skies are blue, with no cloud cover around. South Africa has dedicated more than three million hectares of its total land mass to the conservation of its natural heritage. You will see a great variety of habitats and wildlife when you visit these amazing sites. The Kruger National Park covers around 2 million hectares and is the largest game reserve in South Africa. It is roughly the same size and shape as either Israel or Wales! It covers 20 000 square kilometres and it stretches 350 km from north to south and 60 km from east to west. To the north of the Park is Zimbabwe and to the east is Mozambique. The Kruger National Park will be extended into the Great Limpopo Transfrontier Park by taking some fences down between the Gonarezhou National Park in Zimbabwe and the Limpopo National Park in Mozambique. This will then cover more than 36 000 square kilometres and will be larger than Switzerland. In 1896 the rinderpest virus wiped out most of the region’s game and cattle, leaving the area crippled. Hunters decimated the originally rich game stock between the Crocodile River in the south, Sabie River in the north, Lebombo Mountains in the east and the Drakensberg in the west. Therefor President Paul Kruger opened the National Park to protect and ensure the survival of the remaining animals. Funds for the Sabie Game Reserve were allocated in 1898, but then war broke out. After the second Boer War, James Stevenson-Hamilton, a Scottish born individual, was appointed the first warden in 1902 and a few months later the area from the Sabi River all the way to the Olifants River was added. He removed all human inhabitants from the reserve and began to shoot all predators in order to protect the antelope herds. By 1905, the Sabi Game Reserve had expanded to include more than 17 000 kilometres. In 1926 the reserve was named after President Paul Kruger and was declared South Africa’s first National Park. In 1927 the park was opened to the public and they were charged a £1 entry fee. Only a few people came to visit the park during that year, but by 1935 more than 26 000 people passed through the gates. Today more than 1 million people per year visit this magnificent park. Stevenson-Hamilton was very surprised when lions became one of the biggest attractions and he stopped the shooting of predators. The extended Kruger Park was only fenced in for the first time in 1962. On the 31st of May 1972, the Sabie and Shingwedzi reserves together with 70 privately owned farms were consolidated into the Kruger National Park, one of the greatest parks in the whole of Africa. Altogether there is about 1 982 species of plants, 517 species of birds of which 253 are residents and many other animals. Some of them are the African buffalo, African hunting dogs, cheetahs, eland, bushbucks, zebra, black rhinoceros, white rhinoceros, giraffes, kudus, hippopotamus, leopards, lions, impalas, mountain redbucks, nyalas, redbucks, antelopes, sable antelopes, hyenas, elephants, warthogs, waterbucks, wildebeest, baboons, monkeys, duiker, steenbok and klipspringer. There are also 120 species of reptile including the Nile crocodile, 52 species of fish and 35 species of amphibians. The best time for observing all these animals is the dry winter season (during the months of April to September). The Kruger National Park is a summer rainfall area and during the winter months, the grass is low and bushes don’t have leaves, so you will have an unobstructed view. It virtually does not rain during the winter months which forces the animals to come to the water holes and six rivers that feed this magnificent Park to drink in the mornings and evening. The animals can easily be watched from the comfort of your car. During the summer months the rain transforms the earth into a lush green haven, a flowering paradise and watching birds during this time is excellent. There are also 130 recorded rock art sites in the park you can go and see while you spot the animals on the way. Make sure to take your malaria tablets though before you visit the Kruger National Park. This is malaria area although it isn’t as dominant as in earlier years. Take the necessary precautions by taking tablets, wearing light long sleeved clothing and also protect your ankle area. Read more about malaria before travelling to any malaria destination. Hierdie is ‘n fantastiese resep en ‘n spesialiteit van die Skotte. Dit is een van Suid-Afrika se gunstelinge en die tuisgebakte weergawe volg hieronder. Maklik genoeg om te bak maar maak seker die shortbread brand nie. Dit is veronderstel om lekker bros te wees maar nie donker nie. 1. Botter die meel en suiker saam. 2. Voeg die suiker en sout by en meng. 3. Rol die deeg sodat dit soos ‘n lang wors lyk. 4. Sny dit in sirkels en sit op ‘n bakplaat. 5. Sprinkel suiker bo-op en bak in ‘n voorverhitte oond van 350 grade Fahrenheit. 6. Bak vir 10 minute. As dit nie gaar is nie, bak ‘n verdere 10 minute. 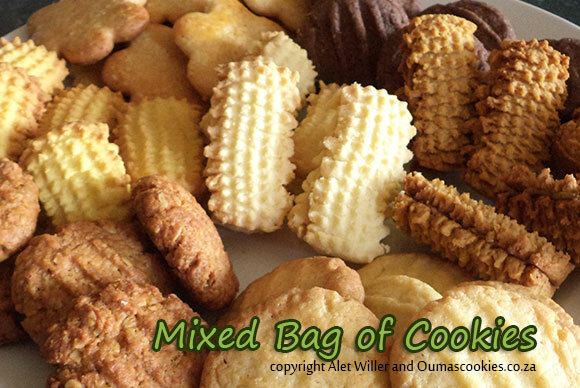 Pampoenkoekies is ‘n wonderlike byvoegsel vir enige maaltyd. Die mees gewilde pampoen wat in Suid-Afrika hiervoor gebruik word is Herbert Squash. Toe ons egter in Engeland gebly het, was dit nie beskikbaar nie en moes ons eksperimenteer… Butternut het net so lekker gewerk en ek gebruik dit nou graag. Dit is noodsaaklik dat die pampoen so droog as moontlik is voor jy dit gebruik, anders is dit te waterig en gaan die koekies nie lekker braai nie. 1. Kook die pampoen in ‘n bietjie water tot sag (tussen 10 en 15 minute). Maak seker die pampoen is baie droog voor jy dit gebruik. Druk die pampoen fyn. 2. Voeg die meel, bakpoeier, sout en eier by en meng goed. 3. 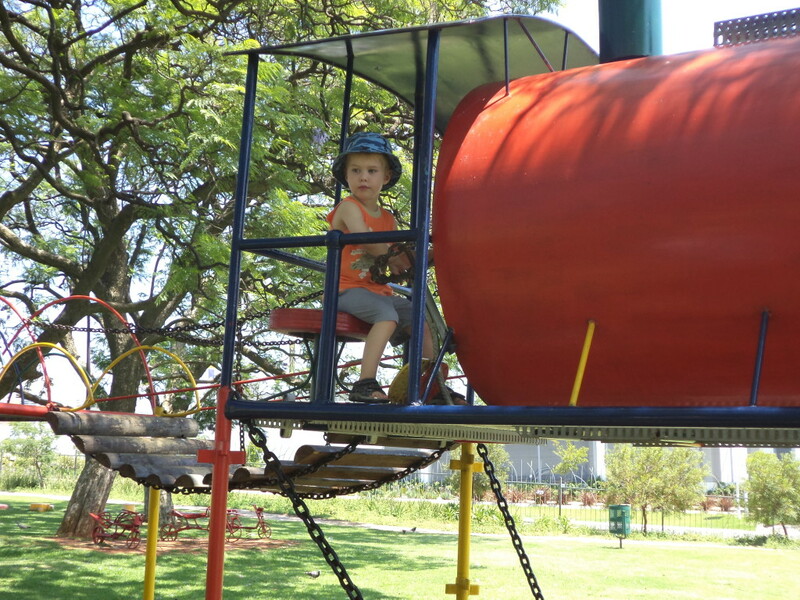 Gooi ‘n bietjie olie in ‘n pan en laat dit warm word. Drup lepelsvol van die mengsel in die pan en braai tot bruin aan albei kante. 4. Sprinkel kaneelsuiker bo-oor of gooi ‘n lekker stropie bo-oor. 1. Laat die botter, water en suiker tot kookpunt kom. 2. Meng die mielieblom met ‘n bietjie water en gooi by. Laat dit vir omtrent 2 minute kook terwyl jy dit meng. 3. Gooi die warm stoop bo-oor die pampoenkoekies in plaas van die kaneelsuiker. The trick is to make sure the pumpkin is very dry. If it is watery, the pampoenkoekies will stick and won’t be easy to make. 1. Boil the pumpkin in a bit of water until soft (between 10 and 15 minutes). Make sure the pumpkin is very dry before using. Mash the pumpkin. 2. Add the flour, baking powder, salt and egg. Mix well. 3. Warm up a bit of oil in a frying pan. Place spoons full of pumpkin in the pan and fry on both sides until light brown. 4. Sprinkle cinnamon sugar on top or make a sweet syrup to pour over. 1. Bring the butter, water and sugar to the boil. 2. Mix the cornflour with a little bit of water and add. Let it boil for about 2 minutes. 3. 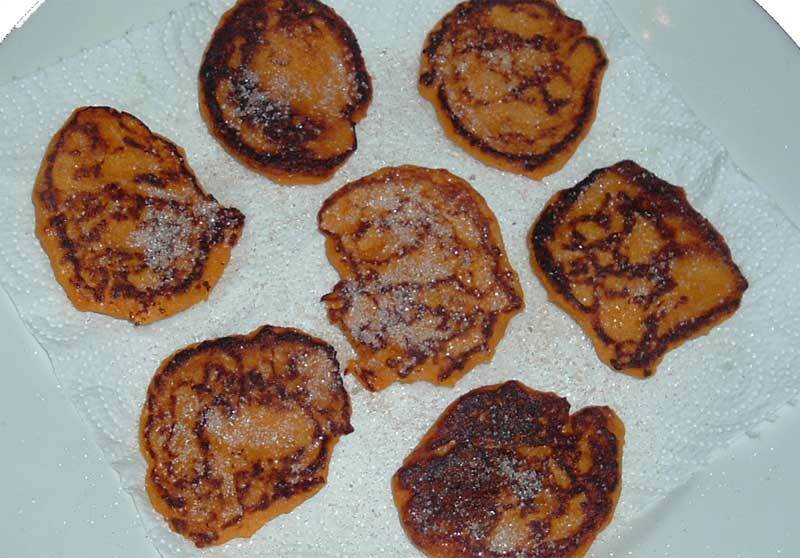 Pour warm syrup over the pampoenkoekies instead of the cinnamon sugar.